I’m sitting on the banks of the Refigi River at the edge of Selous Safari Park as I write this last letter home. The sunset is a brilliant pink, and the hippos are swimming in the river below me. Last night, the hippos kept me awake. 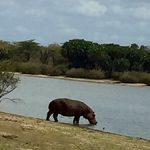 I was convinced there were warthogs around my banda as I heard grunting, and then thought it must be elephants because the sound in the bush was heavy… It wasn’t. It was hippos. Hippos come ashore at night to mark their territory and eat some extra brush. As they are the third heaviest mammal alive (behind whales and elephants), you don’t want to run into one of them on your evening wanderings… Between the hippos, bush baby monkeys, and baboons, I didn’t sleep well. But I’m happy. Since last I wrote, I’ve completely recovered from my GI illness. I’m healthy. And I think all of my students are healthy. Heck knows, they’re all happy. Hard not to be when you’re in a beautiful tented camp in Tanzania, and you’ve just completed your first safari. But before I start waxing on about lions and giraffes, I need to back up. Let me tell you about our HIPZ clinic days. Our first clinic day started with the students loading into a traditional Zanzibarian dala dala. This is essentially the back of a two-wheel drive Toyota pick-up with wood benches along the sides in the back, and a blue plastic cover over the top. Usually the dala dalas are packed full of people, children, chickens, packages, vegetables, all squished tight inside, and maybe even a couple of daring guys hanging off the back. Our students had it easy. 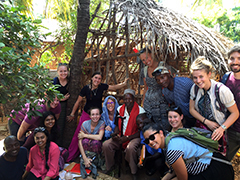 They only had 19 people packed into their dala dala – by Zanzibarian standards, it was practically empty! We arrived at Makaduchi hospital to meet Briony, the MD from the UK who has been volunteering there. As a reminder if you haven’t read letters from me before, hospitals in these parts don’t look like the average American hospital. For one thing, they’re outdoors. Covered paved paths lead you from area to area. Patients are in wards, with 8-10 beds per room. Mosquitoes are abundant, as are chickens and cats. 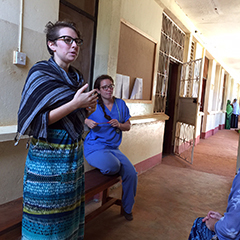 As we toured the hospital, Briony gave us the history of HIPZ (Health Improvement Project, Zanzibar) and told us about the challenges they were facing. This year, they have a dentist. However, the dentist chair is broken, so they can’t do fillings. They also have no anesthetic for extractions. And tooth paste is expensive, so it’s not typically used by locals. They have an X-ray machine. However, the person who knows how to operate it is only around on Tuesdays… sometimes. They have medicine… sometimes. Practicing medicine in these parts requires creativity. 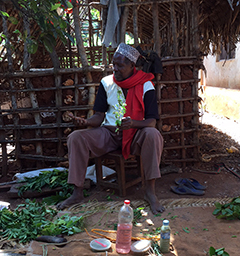 After visiting the hospital, we visited the witch doctor in Makaduchi village. Finding the witch doctor was the first challenge. Of course, there are no street names, and no addresses. So we drove up the dirt road of the village asking locals how to find the witch doctor. People would point, and we’d continue to drive in whatever direction they pointed. Eventually, we ran out of road. We unloaded the dala dala, and on foot, followed a fast walking young man down several twisted paths, past little cement houses and children yelling “Hi mzungu!”, through families of chickens and goats, until we reached a house out beyond a big mango tree. As we waited in the shade of the mango tree, our translators had heated conversations with several locals and the young man. It seemed there were two witch doctors in town and he had brought us to the wrong one. It was an interesting contrast between the hospital and the witch doctor. On the one hand, you have a group of passionate people trying to implement a western medical system in a country that clearly lacks the resources to maintain it. On the other hand, you have medicine that locals have used for hundreds of years. Briony and other physicians know that their patients are using both kinds of medicine – not unlike people using natural medicines in the US. They’re having some issues with this. Women are using herbs during their labor, for example. And the herbs work – but sometimes women are using the herbs too early, so contractions start before the woman has even started to dilate. I’m no OB, but clearly that’s a problem. So Makaduchi hospital winds up treating women who have taken the herbs. The doctors are open to the women taking the herbs, but they’d like to have more say into when to start taking them. It seems reasonable that people work together in this area. But has Briony or the other doctors met the witch doctor? No. And he’s a mere 20 minutes away (if you don’t detour through the village.) Likewise, the witch doctor has not visited the hospital. It makes you wonder how truly interested they are in meeting. 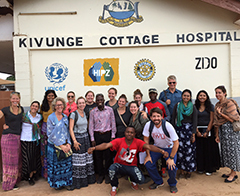 Our second clinic day was at Nungwe, at the northern end of Zanzibar. For this clinic, we had a 1.5 hour drive from our hotel in Paje. 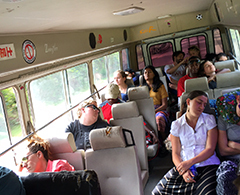 No dala dala for this journey – instead, we boarded a mini-bus at 6 a.m. Our driver, Hotch, thought he was driving a Mercedes on the autobahn. He flew past nearly invisible bicyclists and uniformed children walking to school getting us to Nugwe in record time. Jabir, the program coordinator for HIPZ, met us and gave us a quick tour of the outpatient facility. But we had arrived in time for grand rounds, and that was the true goal of the students. Elizabeth and I stood back and let Paul and the local doctor take the lead for this tour. The students and physicians went from ward to ward discussing patients. There were malnourished twin infants, who were only slightly larger than two hands. There were patients with high blood pressure, and kidney disease. Of course, the nearest dialysis is in Dar Es Salaam, so the patients with kidney disease won’t be treated. The doctor talked about the need for lab tests. Again, while there may be a need, as Paul probed, it became clear that even if there were tests, the access to medicine was so limited that the tests became unnecessary. Jabir chatted with Elizabeth and I as the students did rounds. Hospitals like Kivunge in Nungwe depend on donations. But donations are fickle. People give what they want to give, not necessarily what is needed. So this hospital has excess old equipment stacked along walls and in structures at the edge of the property. It’s all equipment that has been donated with the best of intentions. But sometimes it arrives broken, and there is no one in Zanzibar who can fix it. Other times, people send expensive things like extra X-ray machines. But they don’t have technicians. And they don’t need two or three X-ray machines. Could they sell the extras and use the money for what they do need? Perhaps. But there’s not a large market for X-ray machines in Tanzania, and the export tax makes it silly to try to sell it outside of the country. They could use lab tests – and then the medicines that treat the diseases that the tests are for. But try finding someone who wants to donate that. Not easy. Seeing the extent of health issues in places like this is shocking. Even Paul came out of the hospital feeling somewhat helpless. We’ve learned that post-clinic shock is best medicated with food and waves. So we took the students into Nungwe to process. Octopus curry, chapatti, king fish, fries and cokes as they stared into the waves got them talking again. Ice cream brought them back into bliss – and I think we may have won a ‘best group leader ever’ award. Later in the day, when we got back to our hotel, we discussed culture shock. We explained that images of the hospital may come up for them again – sometimes when they least expect it – but we’ve got a great team at NUNM to support them. 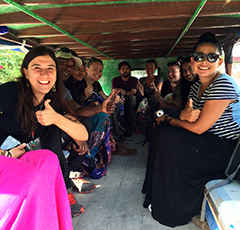 Clinic days complete, we left Zanzibar the next morning to finish our trip with a traditional Tanzanian safari. 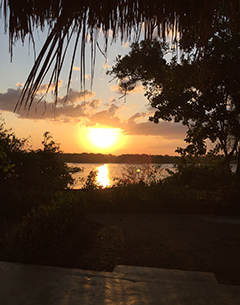 We started with an early morning ferry ride to Dar. I guess I probably should have warned people that the ocean is a bit more rough in the morning, but it didn’t occur to me. So quite a few of our group lost their breakfast as the big swells rocked our speedy ferry. I was sitting next to Elizabeth and used the strategy of idle chatter whenever she started to look green, either from actual swells or from listening to others around us vomit. Eventually, we hit land, and our amazing team of drivers met us at the ferry. 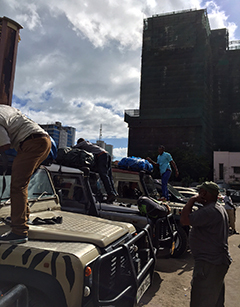 Sky, Julius, Anderson, and John loaded our luggage on top of the jeeps, and we headed for Selous. 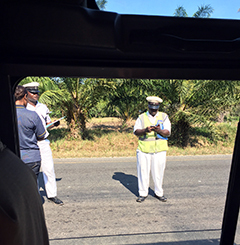 The first half of the five-hour journey is on hilly paved roads, past cashew and mango groves, and lots of varieties of palm trees. Then the pavement ends and it’s dirt and soft sand for the last two and a half hours. As we pulled into Jimbiza safari camp, our hair and skin caked with dirt, the students were ready for ‘camping’ American style. The safari camp is far from American camping. These tents have hard-wood floors, hot showers, and western toilets – along with power, from either generator or solar. And the view is nothing short of spectacular. This is not a TIA moment. Our safari was blessed. We saw nearly everything, which is unheard of in a one-day safari. But we lucked out. Hippos, giraffes, lions, hyena, zebras, wildebeest, crocodiles… So many animals. We’d almost completed our drive and had only seen the backside of a single elephant. So I told everyone that I expected to see ten elephants on the way back to camp. Fifteen elephants later, we brought elated students back to camp. Some of the students are now calling me the elephant whisperer. I’ve had worse nicknames. We didn’t see a chewie (leopard). Elizabeth had really wanted to see a leopard, and we all knew it. But leopards are rare, and extremely shy. Julius told Elizabeth that he’s only seen two in the last six years, and he does more safaris than any of the other drivers. Nevertheless, she had her eyes trained on the landscape and she chanted, ‘chew-ie, chew-ie’ throughout the game drive. As Elizabeth’s jeep rounded a corner, one of the other jeeps decided to help her out. There, lying on the ground was Sky (our teddy-bear-like driver) posing like a leopard, while Paul, our 6’5″ Latvian doctor, did his best monkey impression around him. Gotta love our team. Elizabeth’s wildlife experience was not complete. She had some unexpected visitors in the middle of the night. A whole ant army decided to invade her banda. 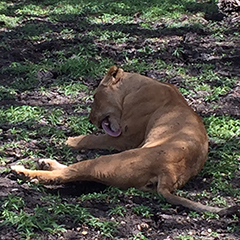 She woke up at 3 a.m. with the safari staff burning huge lines of ants outside her tent. As she looked around, she realized that ants surrounded her bed on three sides, and they were crawling up her legs. I respect her for not shrieking, as I was only two bandas away. Instead, she armed herself with a can of bug killer that had been left in the room, and emptied the entire can on the thousands of ants that had made the mistake of wandering into her space. She also probably breathed enough toxic fumes to warrant a good detox when she gets back to Portland. TIA. The next morning, we did a walking safari with Adidi. Our Tanzanian team wouldn’t tell me anything about Adidi, other than to say that he was pretty crazy, but he knows his stuff. We arrived at 6:30 a.m. at the junction of two dirt roads, and the drivers dropped us off. Adidi greeted us, wearing only some underwear under a baobab bark loin-cloth. He was covered in dirt, from rolling in mud. As he later explained, this was a camouflage technique commonly used by his tribe. Adidi is a reformed poacher. While he used to make money from killing elephants to sell their tusks, he now does a walking safari that is devoted to elephant conservation. In addition, Adidi was a showman as he told us how elephants kept his tribe alive. We walked through the jungle, dodging large piles of elephant dung. Adidi stopped at a large fresh pile of dung explaining its value. Then he dramatically raised a handful of dung above his head and squeezed the water out of it into his mouth. This is not an image I will likely ever forget. TIA. 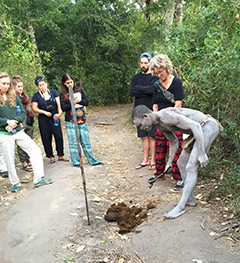 Students gagged, and exchanged looks as he drank the dung water. He explained that his people didn’t die because they had water from the dung. He then chewed on the bark from a tree – so that the dung-water didn’t make him sick. He explained how his tribe learned this from the baboons. Adidi walked us through the jungle, telling us about the medicinal plants. Then he led us to an open dirt road and told us to wait. He ran into the jungle on one side of the road and made noise. Next thing we knew, a large herd of elephants came meandering out onto the road, crossing it to the jungle on the other side. 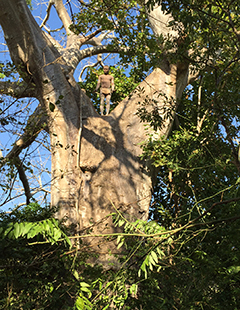 Finally, Adidi climbed up a baobab tree, and sang a prayer for the day. The students said that it was a perfect way to end our trip. And it was. 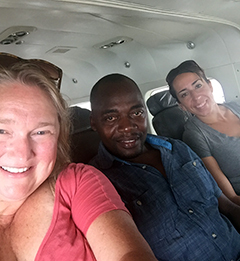 We headed back to Dar to get ready for everyone’s departure. We had a small adventure with some polisi (yes, that’s police) along the way. But after paying a couple of tickets, for what, we’re still not sure, we got into Dar in time to get Paul to the airport. He was our first departure. Our students were off to Egypt, Europe, the East Coast, Kenya, Ethiopia,Texas, India… They have many more adventures ahead of them. Twenty-one days with this crew. An amazing, wonderful group of people. Can’t wait to see what kind of healers they become. I’m in Zanzibar now with Elizabeth and Julius. We’re scoping out some additional sites for fieldwork for our global health students, and setting up the trip for next year. Not a bad place to be solidifying relationships. The waves are crashing below our balconies as Elizabeth and I set up meetings with local NGOs for tomorrow. And little wooden dhow boats are drifting by seemingly without effort. And the sun is setting. Ahhhh. Africa.